More and more businesses are seeing value of Open Source Software to their operations. To ensure success and minimize complications, they often work with a business that can offer assistance in setting up and using the software. Open Source projects tracked on a website called GitHub reported 17.9 million projects currently open, each a separate software programme. 7.9 million people were working on those projects in total. Big names running on Open Source software include Tesla Automobiles, GoPro Cameras, many drone helicopter companies and others! technology services for web and custom-made business solutions. Along with these frameworks, we deliver excellent open source technology services for CRM, ERP, E-Learning using Moodle, Business intelligence and various industry specific web application and mobile solutions. PHP development services assist organizations in deployment of their collaboration, resource planning, customer and supplier management systems as well as web application development. Global organizations competing for customer loyalty and new revenues take their business to the internet with the help of PHP programming and PHP web development. Competing with Microsoft’s ASP and Allair’s Cold Fusion, PHP is completely free and backed by a very large open-source community. Other popular uses for PHP include use with the Apache Web Server as an Apache module and for generating non-HTML dynamic content. Innovare is one of the leading PHP development companies in the San Francisco Bay Area, specializing in PHP programming and Web development services. 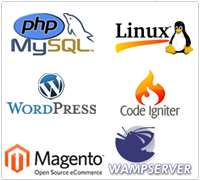 Innovare is ready to offer PHP programming and web development services. A dedicated team of PHP developers will create reliable and scalable solutions to your requirements and to satisfy your needs in PHP application development.